The client’s family owns this land in this residential district over 100 years. Their successive houses have always been attractive in this town. 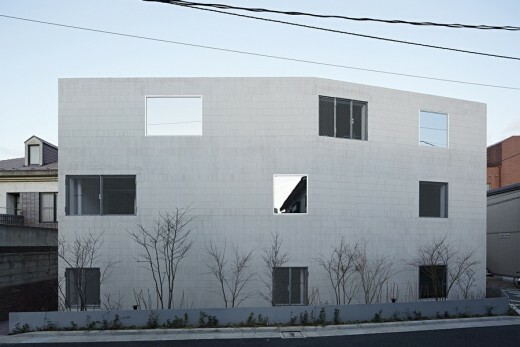 When the client decided to replace the last house made of wood with a new apartment building made of reinforced concrete structures, the client naturally hoped it will be a design which contributes to the townscape as the previous houses had done on this site. The previous houses shared an unceasing inspiration and developed a tradition of using red bricks for the boundary walls and having a beautiful Japanese garden. We decided to continue the tradition and contribute our work to the history of the site. The two approaches are made of red bricks. The inspiration came from the existed garden with beautiful moss at the north corner of the site. The moss garden is noticeable from the street. While approaching towards the entrance one may catch the tranquil beauty by eyes and feel a moment of peace by a sense. The building walls are finished with thin white tiles. A small scale of the tiles on the large walls draws an impression fit appropriately to the scale of the street in this residential district. 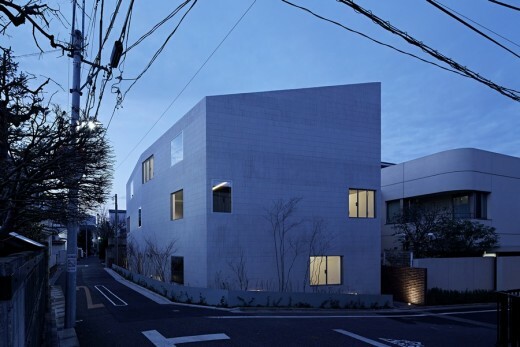 It results in the impression of this building rather a large singular residence than a typical apartment building. The exterior lighting at night is modest and constrained in order to make a mood that keeps a high quality and blends well into the atmosphere of the street. Lighting fixtures have not been installed in the living space, but instead the ‘open rooms’ work as lighting boxes. LED is used with the lighting fixtures in the ‘open room’ and they are invisible from the living space. The indirect light draws a warm and cozy atmosphere into the living rooms. Website : Makoto Yamaguchi Design Inc.